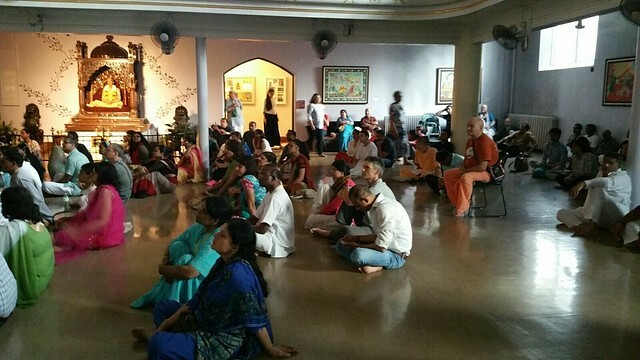 Festival Report: Balarama's Appearance Day ~ The Toronto Hare Krishna Temple! Devotees gathered at the Toronto Hare Krishna Temple to celebrate Lord Balarama's birthday on the evening of August, 18, 2016. Lord Balarama is the elder brother of Lord Sri Krishna and is an expansion of Krishna. The festivities kicked off with an arati ceremony for their Lordships Sri Sri Radha Ksira-Chora Gopinatha, who emerged regally in their emerald green and pink outfits. The Deities of Lord Balarama and Krishna attracted the hearts of devotees by adorning a vibrant red outfit that was bedecked with jewels. Following the arati, Laximimoni Devi Dasi gave a wonderful discourse on the pasttimes of Lord Balarama and Krishna in Vrindavana. By hearing Laxmimoni Mataji's amazing stories, all of us transcended into utter bliss and felt like we were enjoying with Krishna and Balarama! It greatly reminded me of hearing stories as a child, from my grandparents. 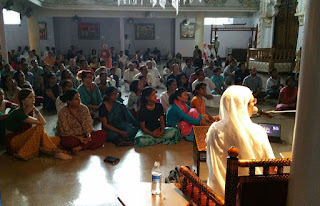 Following the lecture, during the aeati ceremony, there was congregational singing of the Hare Krishna Maha Mantra and devotees sang their hearts out. After all praying to Lord Balarama for great strength, everyone enjoyed vegetarian feast. Lord Balarama's birthday definitely set the stage for the biggest birthday bash of the year Krishna Janmashtami!